UK: the heat / warm is on! The predicted heat wave (or should that be “warm wave”?!) is showing up nicely on latest runs with 30C quite possible in some parts of the South. The lack of rainfall over the next 10 days is also significant. High pressure stays in charge for at least a week with the jetstream being shifted north to Iceland where it belongs in summer! Pressure will build right over the UK from the weekend bringing warm, sunny and dry conditions possibly for another 10 days! 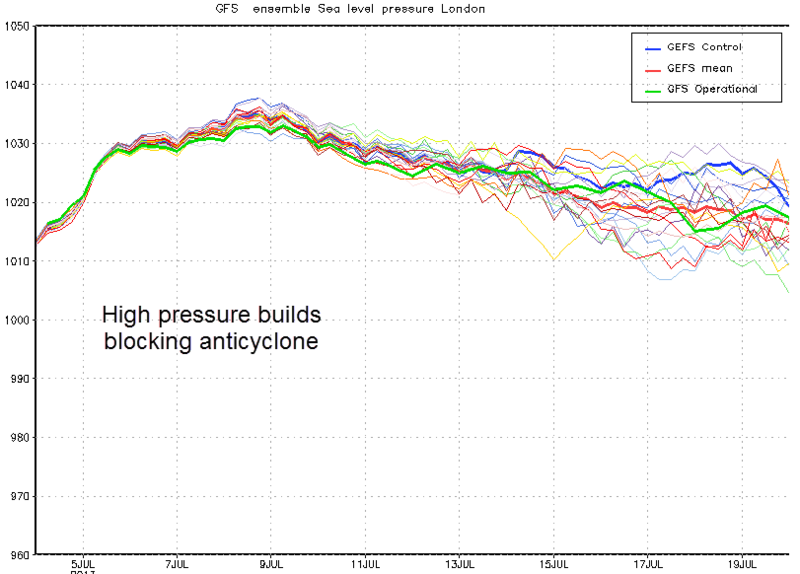 An anticyclone building over the UK will dominate our weather for at least next week and possibly beyond. 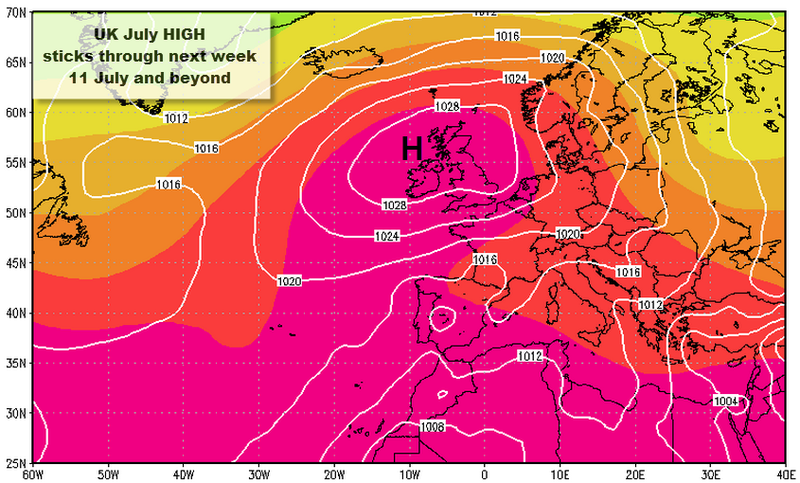 Upper air flow over the weekend will direct warm tropical air from the south and sw over the UK. Thereafter upper air flow will shift to a more northerly flow, slightly cooler. So hottest temps are likely this weekend. Surface winds will be more NE and easterly as the HIGH slips to the North. Whilst winds inland will be light, E and NE winds in the Channel could build through to Monday as easterly winds drain away from the HIGH located over the North Sea. Sea surface temperatures are reaching the low teens around the UK. Very strong sunshine and high temperatures: enjoy and don’t forget to slip, slap and slop! (slip on a Tshirt, slap on a hat and slop on the sun cream!). To become a “Heat wave” the weather must reach a technical threshold and, whilst Sunday will be v warm for the UK, the rest of the week will be just a bit above average: a heat wave is where daily max temperatures for more than 5 consecutive days exceed the average max temperature by 5°C.